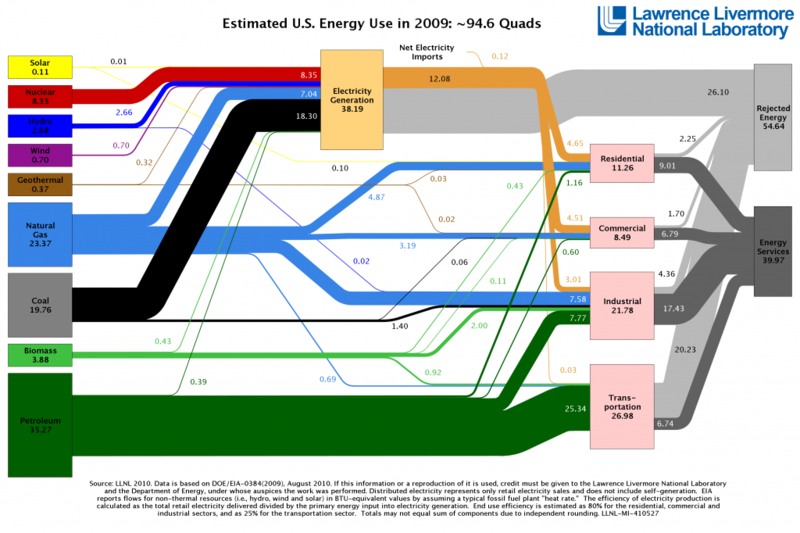 The chart below tells us a great deal about United States’ energy sources and energy consumption in 2009. A quick summary: About 55% of American consumption of hydrocarbons and other energy sources is lost or “Rejected Energy,” about 40% makes it to end users for “Energy Services,” with the remaining 5% going to non-energy uses like making plastics from hydrocarbons. The need to transport electricity in wires over long distances accounts for much of the surprisingly-high 68% of electricity which is lost before it gets to consumers (ratio between 26.10 electricity lost pre-consumer and 38.19 total electricity generated). The table does not account for inefficient expenditures of energy within the “Energy Services” category, energy which makes it to consumers and then is wasted in practices such as leaving the lights or air conditioning on when they’re not needed. Science tells us that we will never get close to 100% useful work out of the energy we generate and consume, but every year we see advances that can up efficiency. More realistic energy prices, which reflect the full costs to society of burning hydrocarbons and of taking land for energy-generation purposes, could stimulate wiser use. Businesses and individuals will respond to market incentives to conserve energy once laws and regulations are in place to encourage full-cost pricing; full-cost pricing for energy includes costs borne by everyone, such as global warming caused by greenhouse gases and the military costs of securing foreign oil. Let’s hope that 2013 and a reinvigorated national government will bring a wiser long-term perspective to America’s energy-environmental balance, and some action. 68% of energy generated lost in the system.That's unconscionable--and avoidable, if we switch as much as possible to renewable sources generated near where they are used. Every little bit may help, and at least makes us feel good.